A new home desk can help you stay more organized and change the way you think about your office in Alpharetta, Woodstock, Sandy Springs, or any other community in and around Atlanta, GA. If you’ve worked at the same desk for a number of years, you may be missing out on the benefits that come from owning modern office furniture. Not only do new desks have innovative storage features, but they can also be more aesthetically pleasing, provide better ergonomics, and may enhance the work environment in your office. At NorthPoint Office Furniture, we have a huge selection of desks on display at our showroom in Roswell, where you’ll be able see, touch, and sit at the desks that you’re considering for purchase. When you visit NorthPoint, you’ll notice that we have home desk options in a variety of styles and finishes that can complement the layout of your office. We carry designs from L-shaped desks to corner desks that are available in colors such as cherry, mahogany, espresso, oak, and more. Plus, we carry desks from some of the most reputable names in the industry, including Cherryman, DMI, Global, HON, and Martin Furniture, so you can rest assured that you’re purchasing top-quality products that will look great for years. 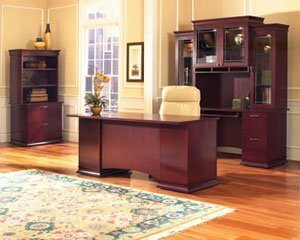 In addition to home desk options, we also offer file cabinets, bookshelves, conference tables, and other home and office furniture. Contact us or visit our showroom in Roswell today to learn more about the home desk options and other furniture we provide for businesses and homeowners in Alpharetta, Woodstock, Sandy Springs, and other communities in and around Atlanta, Georgia.